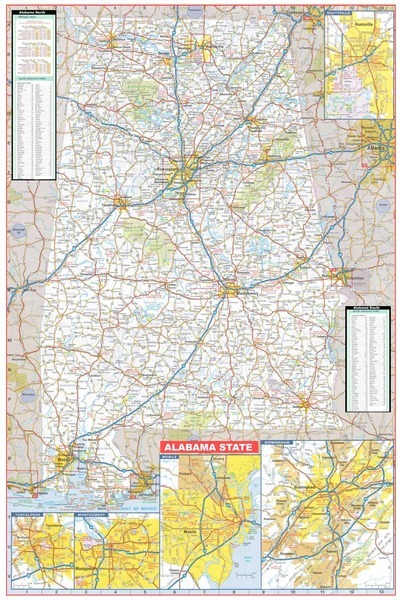 The Alabama Wall Map Executive Commercial Edition is available paper, laminated or framed in multiple sizes from 2×3 to 4×6 feet. The Alabama Commercial Wall Map shows all of Alabama in complete street detail, color coded counties, and inset maps of all major cities in greater street detail. Details all state/federal highways, major waterways, towns, military installations, exit numbers, an index to counties/county seats, major airports, the state university, various points of interest, time zone boundaries, cities, state parks, wildlife areas, and a city/town/place index. 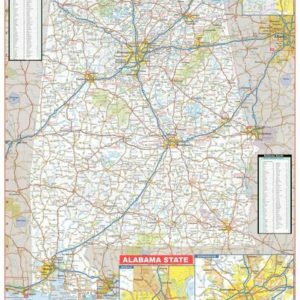 The Alabama Wall Map is available in 3 different sizes to meet your specific application. All sizes are available in paper, laminated or framed.